Strong winds forecast from the North East for the trip back and after a little experiment went with the No. 3 but unfortunately managed to rip it in the pre-feeder at the 5 minute gun. Another good start despite the best efforts of Bedouin. Sheets eased across Weymouth Bay and then a single tack to Bridge but bit too windy for us and ended up with 2 reefs as it gusted up to 26 knots apparent. Couple of short tacks to get through Hurst and a final tack into the finish at East Lepe. 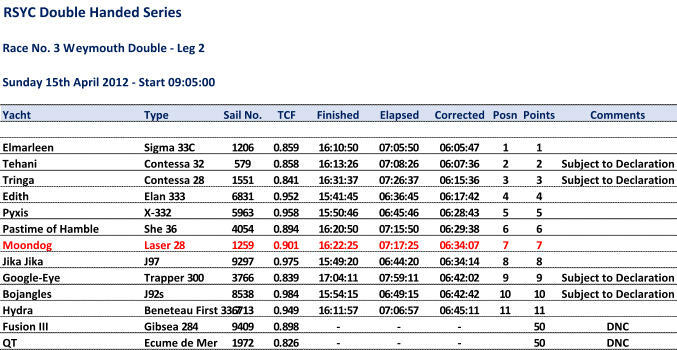 Not too bad a result considering the conditions as we are never going to do well against the heavier boats in blow.